On Friday 29th March 2019 a closing event was held at the General Inspectore for Emergency Situations (GIES) in Chisinau, the event marked the end of a successful five-year partnership with FIRE AID and International Development. Over the last five years, in partnership with Operation Florian and, the Auto Mobile Club of Moldova (ACM), we have delivered valuable equipment and training across multiple principles to the fire service in Moldova, saving over 200 lives already. The project, which was funded by the UK government’s Conflict Stability and Security Fund (CSSF) worked with emergency services on both banks of the Nistru river to build pathways for engagement between Chisinau and Tiraspol, previously non-existent due to the political division which inhibited emergency response cooperation. Throughout the project both GIES and the Fire Safety Unit of Tiraspol have collaborated to complete joint training on water rescue, fire science and incident command, including post-crash response. Firefighters from both sides of the river remarked: “we will work actively in-partnership in future” stating they had built mutual respect and friendship as well as learning from each other over the joint trainings. Although the main project work has been with the emergency services in the Republic of Moldova, the ACM and EASST have enabled over 2,500 school children to be educated on road safety through lessons delivered jointly between the Police and GIES. As a result of this successful work the EASST Road Safety Education Pack is now a part of the national curriculum, and will be shared with school children across the country. Improving the capacity and capability of emergency services can go a long way to reducing the number of deaths on the road. If emergency services arrive in time and can respond effectively to road traffic collisions, the chances of survival in a crash increase by 60-70 per cent. 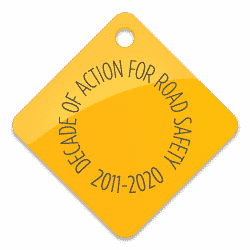 Since 2013 road traffic deaths in Moldova have reduced by 61%, a large part of this reduction can be accredited to FIRE AID’s work with the emergency services and the ACM’s lobbying and campaigning to change laws and improve law enforcement in the country. It is thanks to UK fire and rescue services who donate equipment and provide instructors and volunteers that these achievements are possible. Special thanks go to Kent, East Sussex, West Sussex, South Wales, Tyne and Wear, Manchester and Surrey fire and rescue services amongst many others for their support as well as to the GIES and the Fire Safety Unit of Tiraspol for their support, enthusiasm and professionalism over the last five years without this the project could not have succeeded.